Bengal levelled ball-tampering allegations against Railways on Day Three of their Ranji Trophy quarterfinal at the Eden Gardens, the second game in a row between these two sides, which has had a touch of controversy. The on-field umpires, Suresh Shastri and Paschim Pathak, changed the ball in the 15th over of the Bengal second innings. The umpires also reported that the ‘ball was damaged’ to match referee Rajendra Jadeja. The Railways started off with medium pacers Anureet Singh and Krishnakant Upadhyay. Shortly, the umpires had a conversation with Railways captain Murali Kartik. The ball was changed with Bengal on 15 for two. Railways were given a warning by the umpires. “There were some issues with the ball. It was damaged and the on-field umpires brought the matter to my notice after the ball was changed. The umpires issued a warning to Railways (for the ball being damaged). The matter has ended for now. If there’s a second complaint (by the umpires), a five-run penalty will be imposed (on the fielding side) and then the whole issue will be referred to the BCCI disciplinary committee,” match referee Rajendra Jadeja said. “The damage may not necessarily amount to tampering. We’ve to look into it, subject to a second complaint,” Jadeja added. Incidentally, ball-tampering is a Level-2 offence and the penalty is a deduction of 50 to 100 per cent of match fee. The Bengal camp, however, claimed the ball had been tampered with. “They (Railways) had been scratching the ball right from the start. “The umpires warned Murali Kartik, but it continued. Then I and coach Ashok Malhotra went to the match referee and informed him about the matter,” Bengal team manager Debabrata Das said. Kartik refused to comment on the issue but Railways coach Abhay Sharma denied any wrongdoing. “No one has spoken to me about this. Maybe the ball was damaged because it hit a metal protrusion outside the boundary,” he said. There has been a shimmering tension between the two sides since Railways skipper Kartik ‘Mankaded’ Bengal batsman Sandipan Das during the group league encounter at Jamia Milia Cricket Ground in Delhi. Chaos broke out as Railways’ players were leaving Eden Gardens after the day’s play. A fan, who had been constantly heckling Kartik from the stands, barged into the designated press conference area. He was confronted by Railways medium-pacer Anureet Singh. The two almost came to blows as there was no security personnel. Kolkata: Verbals flew thick and fast between the sides. There were ball-tampering allegations and even a scuffle broke out between a cricketer and a fan at Eden Gardens. All these unfortunate incidents shifted focus from what has been a fascinating contest between Bengal and Railways in the quarterfinals. Even as stumps were drawn on Friday to conclude the third day’s play, no team managed a clear advantage despite the fact that the hosts began the day by bowling out Railways three runs short of their first innings score of 317. About two hours after the wild celebrations, there were several long faces in the Bengal camp as the scoreboard read 40 for four. The day began with Bengal’s seamers Ashok Dinda and Shib Shankar Paul hoping to break the partnership between Mahesh Rawat and Arindam Ghosh, who were unbeaten on 105 and 78 respectively overnight. Rawat went first, edging a Paul outswinger to ‘keeper Wriddhiman Saha who dived flamboyantly to his right. The 218-run sixth wicket partnership was broken and then Bengal ran through the opposition lower half. From 260 for six, Railways were all out for 314. Ghosh made 97 but got out to a poor shot as he tried to play a length ball from Dinda across the line. The medium pacer returned with six wickets but Paul was the team’s best bowler, notwithstanding the fact that he bagged three. 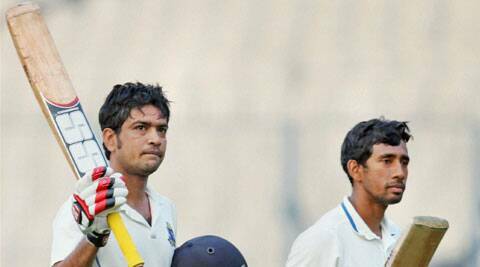 Bengal’s second innings saw yet another top order collapse before captain Laxmi Ratan Shukla put in yet another rescue act. Shukla, completely unfazed by all that was unfolding around him, took the attack to the opposition. He remained unbeaten on 63 at stumps with Wriddhiman Saha, 30 not out, giving him company. Together they’ve taken the score to 133.